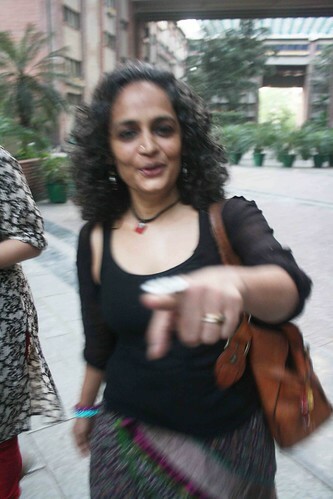 One evening, The Delhi Walla sighted his most beloved Delhiite – author Arundhati Roy. 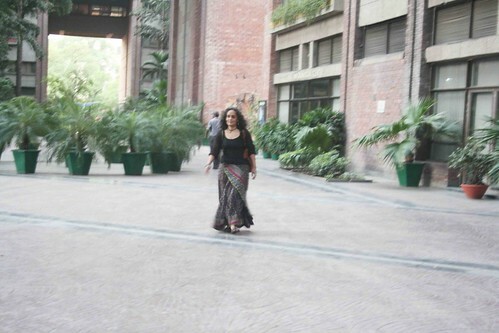 She was in India Habitat Center, a giant cultural complex in central Delhi that host book launches, art exhibitions and high-brow theater dramas. Ms Roy was walking alone towards the amphitheater. 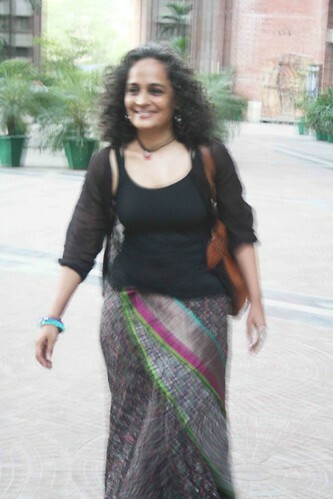 She was wearing a long sarong-like skirt, which seemed originally to be a silk saree. A wide golden silk border ran along the skirt. Upward, the author of The God of Small Things was in a black sleeveless top, topped with a black see-through cotton jacket, which had elbow-length sleeves. The frills consisted of a blue bangle, two finger rings (one was very large), a minimalistic necklace and a pair of earrings. A brown leather bag was slung on the right shoulder. The hair was curly, partly grey and combed mutinously. Ms Roy looked like a free man, as if her happiness did not depend on any lover or novel. The evening sunshine was dancing shamelessly on her body. Her hips were swaying wildly. Her cleavage was exposing her independent spirit. She was smiling to herself, as if in a dream. As she came close, her gaze fell on me. A moment later, it shifted. A moment later, it moved back to me, as if it was trying to recall something from the past. 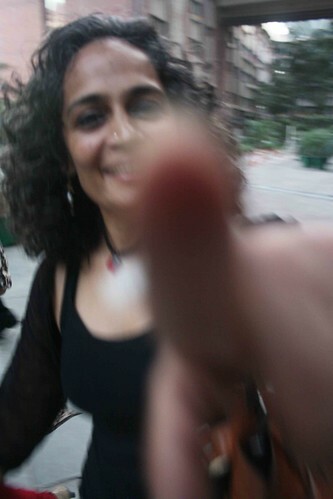 A moment later, the novelist pointed her finger at me and exclaimed, “I know you, I know you. You keep stalking me.” She then turned away and vanished. What an absolutely remarkable woman! What do you mean by ‘Her hips were swaying wildly’??????? How could they??? What happened to ‘the jazz tune’err..replaced by a ‘ringing in the ear’ ehh?? Ok, this is borderline obsession. Can we get some more interesting material please. I agree with Joe above. This woman seems to get a lot of unnecessary coverage on this blog (I understand she is your favourite Delhiite but still!). As a Kashmiri, I am appalled by her comments that Kashmir does not belong to India!!!!!! amongst many other political faux pas’s. Does it belong to Pakistan then? or Afghanistan (which undivided Kashmir actually has a border with? I abhor her complete ignorance on this subject! By the same account should South India become independent since Dravidians are separate people to Indo-Aryans present in North India???? On a separate note, can you please tell her to dress a little more modestly the next time you are stalking her. Frankly speaking this woman has neither any dress sense nor any sense of sartorial morality. Currently hips are dangling and cleavage is bare, what next? See-through sari? “Please tell her to dress a little more modestly”. I am appalled by your chauvinistic moral policing. 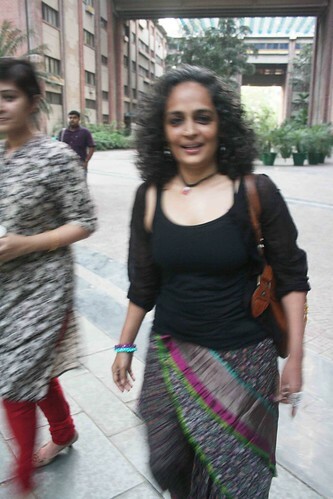 India’s a free country last I checked, & thus she has the right to state her opinions, dressed in a see through sari if she so desires. You & others have the right to disagree, but end up displaying your ignorance when you descend to attacks on her sexuality. Debate her positions instead of her lack of modesty and such. 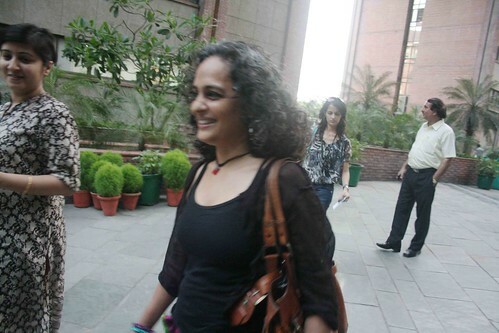 Maano, a wonderful pictorial and text on Ms.Arundhati Roy! ‘The God of Small Things’ is a mesmerising novel – lyrical, that moves from laughter to tears. But, I relish her ‘Power Politics’ and ‘War Talk’. 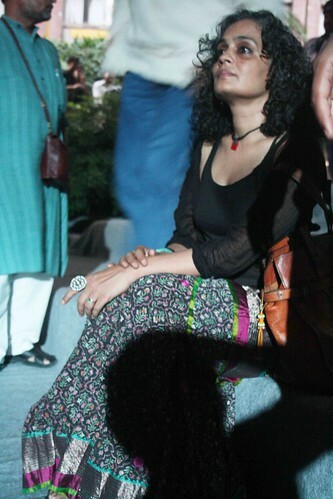 to Ehsan Mir Ali Jahan: She has her unique way of dressing up! In fact, she is charming! I had first seen Ms Roy in 1989. She was as beautiful as today and as unconventional dresser as today maybe a bit wilder. I am sure Kashmiris who want to keep their women in concrete walls will not like her. May god give us more women leaders like her in india today. and we let these people survive. As a kashmiri and an indian and a non believer in ahimsa, i would love to shoot her down some day.